Gloria Allen is one of the foremost breeders of Hyacinthine Macaws in the world. She has made presentations in both North America and Europe on her philosophy and techniques. A couple of years ago I was asked which bird I would breed if I could only keep one pair of birds, The thought was of such startling capacity that I was never able to answer. I felt as if had been asked to tell which of my children I liked best. 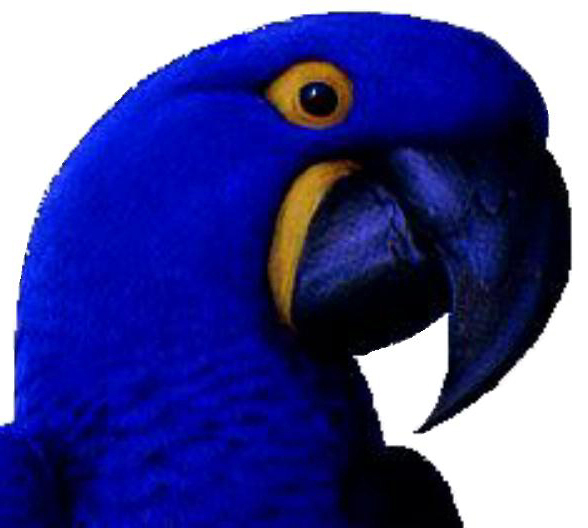 Today, I would like to make a public admission that I would, given this choice, keep the Anodorhynchus hyacinthinthus, commonly called the Hyacinth Macaw. Keeping and breeding the Hyacinthine Macaw has been one of the greatest joys of my life and certainly has been one of the highlights of my bird breeding career. These lovely creatures, measuring from thirty six to forty inches in length and possessing a beak that can crack Brazil and macadamia nuts with great ease, are some of the sweetest and gentlest of all of the macaw species. Although a tame Hyacinthine Macaw makes a wonderful pet, any birds currently in captivity should be considered for future breeding stock. The Hyacinth is decreasing in numbers both in the wild and in captivity. The natural location of this species of macaw is limited to a wetland of Brazil called the Pantanal, with a small group of families having been seen in eastern Bolivia and in northwestern Paraguay. This is thought to be seasonal migration ( Ridgley 1981 ) Not a tropical rain forest bird, according to the noted scientist Dr. Paul Roth who has spent many years tracking and counting these birds, they prefer to live, instead, on the edge of the great forests, sharing their habitat with the equally large Green wing macaws ( Ara chloroptera) and the vibrant Scarlet Macaw (Ara macao). Importation has been a serious problem for this wonderful bird. Articles were written about the mellow behavior of the animal and as the importers brought the birds through the quarantine set-ups legally into the pet market, the numbers in the wild decreased. In the year 1916, when visiting the Mato Grosso valley, a pair of scientists, Roosevelt and Rondon; declared these birds to be abundant in nature. When it became known that these giants of the bird world were also gentle and loving they quickly became much sought after as pets. This very fact created, like a two headed monster, the interest of the bird breeders who saw dollar signs, as well as the breeders who would assist the animal in reproduction to assist the species. It is an unfortunate fact that the worldwide interest that we as aviculturists have in the birds can be one of the determining factors for the survival of the species in the wild. With this in mind, our aviary has never purchased a bird from quarantine stations. I am safe in saying that there are less than five thousand of these big beautiful birds left in the wild and in captivity, combined, as we attend this conference this week. Soon the race was on to obtain breeding stock. We, too, looked in every bird publication and every newspaper to obtain our breeding stock when it became clear to us that the birds were rapidly disappearing from the wilds and might be in need of human intervention. Many birds that were imported came into the pet trade carrying a number of bacterial and nematodal problems. Dormant psittacosis became active in many of these wild-caught birds and many died of these bacterial infections. Many birds were subjected to man's inhumanity to animals while they tried to mold the birds into a living room entertainment center. Little consideration was given to providing the bird with a large enough living space and the ensuing physical problems were many. Arthritic joints from sitting on a level perch (the weight of this bird requires that he be able to live on an uneven surface and walk around on the ground). Improper diet created birds that had gout or kidney problems (the needs of this bird does not include a high protein diet thought by many a few years ago to be needed). Thin sickly animals were found that were not given nuts in their diet ( an absolute necessity for the health of this bird). These birds have been imported into the United States as late as the early eighties when an importer brought into the country a group of approximately two hundred birds. These birds, after exiting the U.S. required quarantine, were sold around the country, like the commoner macaws, to the people who regularly purchased from the quarantine stations; pet stores as well as breeders. Some years later, the birds there being offered in local newspapers all over the country for resale, as people found that they were unable to tame the wild-caught as easily as the other wild animals with which they were accustomed to dealing. This proved to be a bonanza for the breeders. The birds were very happy to be put back into a family situation. These birds are now being bred prolifically throughout the country. The illegal trafficking in the Hyacinthine Macaw has come to a fortunate close; but the interest of the general public, as well as the avicultural community is still active. While this is a fact, it is necessary for those of us who breed birds to find places in our aviaries and to help these birds. I need not tell you that every bird you breed leaves one in the wild, for we are all aware that the trapper still exists; and while the governments of the country of origin are unstable, the smugglers will still find ways to move the birds out of their natural habitat. The Hyacinthine Macaw, while far and away the largest of the macaw species, does not require much larger breeding accommodations than does the Green Wing macaws or the Scarlet Macaw. There are a few guidelines that I would like to offer to the would-be breeder of the Hyacinthine Macaw. The cage should be made of material with openings no larger than one inch square. A larger link would permit your breeders to potentially put their head through the links and be unable to return it to the cage. The jaw line of these birds is quite wide and their nature inquisitive, The cage should be double the width required for your birds to stand side by side on a perch and raise their wings fully. The wing span of the average Hyacinth Macaw is about thirty-six inches, thus the birds standing side by side with outspread wings equal seventy-two inches or six feet; therefor using our formula, this cage should be no less than one hundred forty four inches or twelve feet. The length of their cage should be at least this same figure. The reasons for this formula being given rather than just telling you make the cage twelve feet square will become obvious when we talk about the birds copulation pattern. The floor of your aviary should be cement. The Hyacinth Macaw loves to get down and stalk around menacing imaginary playmates. While grass may have an appeal to the aviculturist we must remember that it cannot be sterilized and the birds could pick up nematodes (worms) from this natural foundation. All perch material should be natural wood. Preferably very hard wood so that they do not require constant changing. The birds will chew them. The perches should be uneven in size as this helps prevent arthritic joints. A large nest box about forty inches long and twenty inches square should be placed high in the aviary. The entry opening should face the front of the cage. The Hyacinthine macaw wants to sit on her eggs and still see what is going on around her, so as we do not want her to leave her eggs we make this entertainment easy for her to obtain. In the back of the box will be the aviculturists view door. Thus while the assistant is feeding the front of the cage and has the full attention of the birds out of the front door, the aviculturist can open the back of the box and check on the eggs and or chicks. This opening will also enable you to remove a chick, band his leg and return him to the nest while the parents are occupied with their morning meal. The Hyacinthine Macaw has a diet that differs from the average macaw in that they are primarily nut eaters. The palm nut is preferred by the Hyacinth Macaw (actually the endosperm of one of two palm species); often to the exclusion of all other forms of food. One of the biological peculiarities of this bird is that they are able to consume enormous amounts of fatty foods without getting arteriosclerosis as other birds of their size would. Indeed we find that a high fat diet is REQUIRED to raise healthy youngsters of this species. As to the other nutritious food we would have them eat, do not despair, you will be able to get them to eat almost anything. Just mix your vegetable mixture together with a pelleted diet. We use PRETTYBIRD MAINTENANCE DIET. I then mix this together with the beloved nuts. Given in this manner, the birds will be forced to get the other food on their beaks when their scrounge through this gooey mess for their nuts and later, when the nuts are gone and the hunger pangs bring them again to the food tray they are willing to "give it a go," as the Englishman said, and soon they are eating all you will give them. Later then you can separate the food types, mixing the pretty bird half and half with any large hookbill mix and placing this in the nut dish. Whether you make the decision to let the parent birds raise the chicks or if you have decided to take the eggs and incubate and hand feed from day one, now is the time for you to set up a nursery situation so that you will be able to help the family if called upon to do so. A Hand Fed Baby Versus A Parent Fed Bird: There are many who believe that hand feeding a bird will preclude his interest in raising a family of his own in a breeding facility. While we have found this to be true with many a cockatoo, I can tell you from our own experience this is not the case with this particular animal. Our own hand raised birds lived in our living room for a period of about three years until they became such an annoyance with their constant copulating. This, at times can be very loud, though happy sounds. They had to be put to the breeding facility and my husband, the previous pet connection was barred from entering to play with them. They quickly (at about four years old each) became parents. This year we are now raising two of their young and they raised one. Unfortunately they disciplined the baby by biting all of the toes off of one foot and threw him out of the box. We feel he was in the way of the next nest of eggs, which we are now incubating. It is the habit of our aviary to take the first eggs, incubate in the Humadaire or the Grumbach incubator and hand raise these chicks and let the parents incubate, hatch, and raise the second clutch on their own. Every baby hatched is first swabbed on his navel with a dilute of Betadine Solution, weighed, and a computer number assigned to reflect his parentage, date of hatch, and weight. Then a microbiology slide is made using Grams Stain and looked at for the presence of possible pathogenic bacteria. If found, the bird is housed in an isolation chamber with a constant temperature of 98°F (36.5°C). The complete set of microbiological plated material is used to detect the type of bacteria the bird is carrying and the necessary steps needed to make the bird well. When we know that the bird is not carrying a pathogenic bacteria he is then put into our nursery with the other babies. NOTE: Many bacteria not thought to be life threatening to most Macaw species i.e: Gram Positives such as Streptococcus and Staphlococcus, can be life threatening to the Hyacinthine Macaw. Serious steps must be taken when handling the eggs and the babies as human hands can be a contributing factor to transference of the bacteria mentioned. In many instances, a good healthy pair will double and even triple-clutch. Last year we had one pair that had five clutches; the last baby being born on Christmas day. We were not even aware that they had eggs. They fed the baby beautifully and on the first of February we took a gorgeous bird from the nest. When your birds are being given the opportunity to lay more than one time each year, the diet should be high in fat, with lots of brazil nuts; macadamia nuts, and coconut fed on a regular daily basis. Water is not usually used to vitaminize the birds; however a bird that lays more than two clutches is taking the nutrients directly from her own bone and muscle tissues, so we add Nekton E and Nekton 5 to the water on a daily basis and once a week these pairs are given a calcium supplement that is water soluble called Neo-Cal Glucon. All the food is sprinkled with Diacalcium-Phosphate powder after the second clutch is hatched. We at Allen Aviaries have been known to foster an egg with a other parrot when the parent birds are known to throw eggs out of the box or kill babies. However, it is more common with us to foster other eggs beneath our Hyacinthine Macaws as they are exceptionally good parents as a general rule. Many a rare cockatoo has been left with the Hyacinthine Macaw for the duration of the incubation process and taken just prior to hatching. Great care must be taken, however, to note the day that the Hyacinth has laid her eggs as she will incubate only for the period of time it takes her egg to hatch (generally twenty-nine to thirty days). Thus she will leave the fostered egg to chill if her time cycle is finished. These birds are not difficult to raise as hand-fed nestlings, but a few changes in the diet that you might be feeding your nestlings could be necessary. Diets fed to the general psittacine baby should be fairly low in fat content with a proper balance of protein. Many hand-feeding formulas on the market today are good diets for the other psittacine species, i.e.Cockatoos, Eclectus, Conures, Mini Macaws etc. Some I can mention that we have found to be of benefit are Kaytee Exact Pretty Bird, Tropican-Hagan, and Roudybusch. However, for the Hyacinthine Macaw, whose parent birds in the wild would be eating a diet consisting mainly of the palm nuts (Yamishita 1986), a diet known to have about twelve to fourteen percent fat content is necessary. The only food on the market that is formulated with the Hyacinthine Macaw in mind has been put together by the PRETTY BIRD INTERNATIONAL COMPANY. Michael Mastey, a concerned bird owner-lover himself, was kind enough to work long and hard and listen to what we told him about the birds' apparent needs, and come up with this version of his formula for our beautiful birds. At last, freedom from grinding. The research being done at this time by this progressive company has the assistance of noted veterinarian Dr. Susan Clubb, who will be speaking at this conference. The brooder now being used by Allen's Aviaries are Human Isolettes (Ohio Mfg Co.). The temperature and humidity controls are in the front of the unit with a water well refill also in the front. A built-in temperature gauge on the face of the unit makes keeping the temperature correct a simple matter. The Hyacinthine Macaw seems to have a higher than normal (for other macaws) need for humidity. The parent birds in the wild make their nests near the rive banks; therefore, the humidity in our brooders is about 40 percent for the first few days of their life. Then dropped to about 35 percent. A second thermometer on the interior surface is always a good back-up. A newly hatched Hyacinthine Macaw baby is altrical, which means that it is unable to feed itself or maintain body temperature. Therefore the bird, when newly hatched, is placed in an incubator in a small flat bottomed container with a napkin beneath his body. The temperature of this human incubator is an ambient 92°F (33°C). This is lowered on a weekly basis until the bird is in good pin-feather. He is then maintained at about 88°F (31°C) until his feathers are beginning to open. After which he is put into a warm room in a large open container in which hi is able to move about comfortably. When he shows an interest in the outside world, and is climbing to the top sides of the brooder, he is then introduced to a cage. These big, sweet birds take approximately seven months before they are eating on their own well enough to leave the hand feeder. A caution to the would-be owner of one of these lovely creatures; NEVER ACCEPT AN UNWEANED BABY. The Hyacinthine Macaw is a very sensitive creature, throwing himself on his back and flaying his legs wildly when seeing a stranger in the nursery. When going to a new home prior to fledging, the extreme stress that is felt by the bird can result in gram negative bacteria and gram positive bacteria becoming a pathogenic threat to the life of this bird. Handfeeding in the hands of even the most experienced of bird feeders is found to be quite difficult and many a would-be Hyacinth owner, looking for a better price, have had a baby Hyacinth die when sold to them prior to complete weaning. Every year we are able to raise about fifteen to twenty-five Hyacinthine Macaws. These birds are all sexed with cytology by the Avian Genetics Lab in Bartlett, Tennessee, USA. We then have Dr. Scott McDonald, noted veterinarian from Highland Park, Indiana, come to our farm and implant computer-chips in the pectoral muscle of each bird. This tiny chip transmits a number with which your bird can be identified at any time during his life. Cage size in a home situation will be a determining factor in the health of your animal. You should expect to give this "Gentle Giant", as they are often called, as large a cage as possible; keeping in mind that he has very long tail feathers and the need for depth is as important as the need for width. When introduced to a prospective future mate at a young age, you will find the birds will bond with each other and still be interested in being a part of your family. We put our pet Hyacinths out into the breeding facility at about three and a half years old. We do not, ever again, try to make the bird back into a pet; we feel that the ensuing confusion could prove detrimental to his over-all sense of well being. We content ourselves with the "Job well done" feeling when he and his mate make good parents themselves. We screen those who would own these birds for their potential as breeders and have found a great interest in the world for the keeping and breeding of the Hyacinthine Macaw. Many of our birds have gone out all over the world to procreate the species in other lands, I cannot tell you the satisfaction that this gives the breeder. We know now that with the ongoing interest of the aviculturist, the continuation of the species is real and perhaps some day we will all join forces and become part of a reintroduction program as has been done with a few other species.